But boring. I realized halfway through the baking that I forgot to add the quarter teaspoon of salt (did I inherit this trait from my mother? ), which may have made a difference, but the flavor was just a bit boring all around, and the frosting was sickeningly sweet. I’ve eaten buttercream many times, but this was the first time I saw exactly what goes into it. Perhaps that affected my judgment. All that butter! All that confectioner’s sugar! I don’t know what I thought was in there. I’m looking for a creamier, more mommy-tasting frosting, if anyone knows of one. One that’s as different as possible from Magnolia Bakery’s frosting in flavor, texture, and edibility. Is a full cup of sugar the norm for an 8×8 pan of brownies? My problem might be a general dislike of sugar, but I find these brownies more sweet than chocolaty. The texture is good, but what I really want is a dense, deeply chocolaty brownie with a crackling crust on top (basically, brownies that taste like the Ghirardelli mix brownies that I used to make years ago). Anybody? Neither of these recipes are worth typing out, but if you’re very eager, you can search inside the book on Amazon. You actually should just buy the book if you don’t already have it. It’s only $14, and as much as I complain, you’ll find hundreds of things you want to make in it. Try the Barefoot Contessa’s brownies. Very dense, very chocolately, and not all that sweet. You can find it online at foodtv.com, (is this a blog no-no? ), or you can find it in The Barefoot Contessa Cookbook. 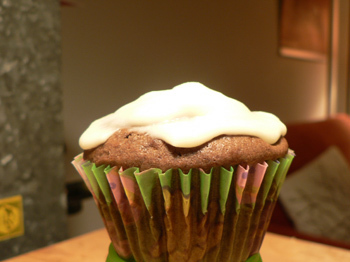 I make cupcake frosting using a boiled frosting recipe – like Italian meringue but doesn’t get baked. It’s gorgeous, holds its shape and doesn’t clog your arteries (much). I looked up the Mark Bittman recipe and I’m not surprised you were dissatisfied with it – a niggardly 2 oz. of chocolate! I can’t believe they tasted like brownies at all!! I use a recipe from Cook’s Illustrated that calls for 7 oz. of chocolate in total, some unsweetened and some semi-sweet, plus several tablespoons of cocoa powder. 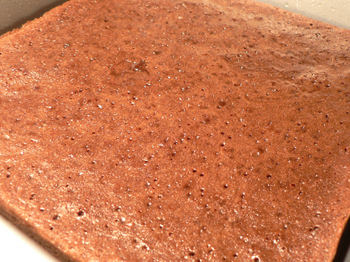 And yes, a cup or more of sugar is standard for an 8 inch pan – brownies are sweet and the sugar helps make them fudgie. Or is that fudgy? Or fudgey? They all look funny.